Edwin Encarnacion was born on Friday, January 7, 1983, in La Romana, La Romana, Dominican Republic. 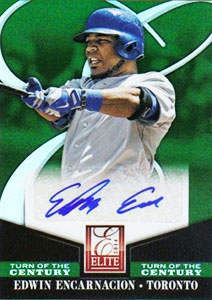 Encarnacion was 22 years old when he broke into the big leagues on June 24, 2005, with the Cincinnati Reds. His biographical data, year-by-year hitting stats, fielding stats, pitching stats (where applicable), career totals, uniform numbers, salary data and miscellaneous items-of-interest are presented by Baseball Almanac on this comprehensive Edwin Encarnacion baseball stats page. Did you know that Edwin Encarnacion had five multi-home run games in that historic month mentioned above? It tied the record for most multi home run games in any month in Major League history - a total only reached twice before, once by Harmon Killebrew in May 1959, and once by Albert Belle in September 1995.